A nuance in the ABU is the sizing. The Jackets are sold like a traditional men's jackets (i.e. 42 Regular, etc) and the ABU pants are sized by waist size (i.e. 30" waist) Some sizing tips are given below. Used: All in excellent condition meaning they will be perfectly functional at the high standards of the USAF. There will be no rips, no tears, no holes, no obvious permanent stains (we looks them over carefully, but we could miss something very small and out of the way). All velcro and buttons will be ready for use in excellent working condition. The item may need to be laundered or may have been laundered showing some fading but these uniforms are made to last through many launderings and if they are not in excellent shape we do NOT sell them on the internet. Used items may have rank, unit and/or name patches attached. Men's Coat Sizing Tips: All Extra-Short lengths assume a height of 59"-63", Short height of 63"-67", Regular height of 67"-71", Long Height of 71"-75". Chest size is the size of the coat but fits one inch smaller than that size also. 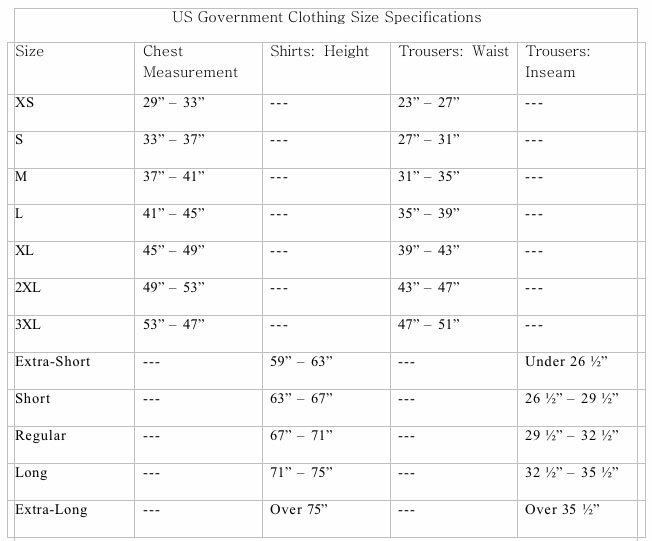 Sleeve length varies according to size. 36S Sleeve length is 21 5/8" , 36R Sleeve length is 22 3/8", 36L Sleeve length is 23 1/8". 38S Sleeve length is 21 3/4", 38R Sleeve length is 22 1/2". 40R Sleeve length is 22 5/8", 40L Sleeve Length is 23 3/8". We hope this gives a good idea in helping you decide if any of the jackets we have will fit. Men's Trouser Sizing Tips: Extra short inseam: 29"-30", Short Inseam: 31"-32", Regular Inseam: 33"-34" and Long Inseam: 35"-36". Waist measurement is the same as the size listed and will also fit one inch smaller than the size (ex. Size 28 fits a waist between 27" and 28"). Women's Coat Sizing Tips: Chest: Sz 2/32", Sz 4/33", Sz 6/34", Sz 8/35", and so on to Sz 16/40 1/2". Sleeve length varies according to size 4S/20", 4R/20 3/4". 6XS/19 3/8", 6S/20 1/8", 6R/20 7/8", 6L/21 5/8". 8S/20 1/4", 8R21", 8L/21 3/4". Up to size 16R/21 1/2". Women's Trouser Sizing Tips: Waist: 2/24",4/25", 6/26", 8/27" and so on. Length: Extra-Short length: 29 1/2", Short length 31 1/2", Regular lengths: 33 1/2", Long lengths: 35 1/2"